New year, new bikes, new tours! Get a taste of Victoria, BC with a group or private tour this year. We also have flexible start times for cruise ship passengers. We love our city and have our favourite places to stay, things to do and places to eat. Here’s some things that we’d do with our family and friends if they were visiting Victoria. If you’re looking to rent a bike we also got you covered. For me, gratitude isn’t a platitude for the sake of trying to make myself feel better on a particularly dreary day. It’s a practice. It’s a way of life to inspire me to keep doing what I do even when the weather looks like no one will ever want to bike again. I ride in every season, when the weather is right! Victoria is very quiet in the off season, so pre booking is recommend to avoid disappointment. Come for a Fall or Winter Highlight City Bicycle Tour with Matt! Summer memories of the Discovery Bicycle Tour of Victoria BC! I had so many amazing trips around Victoria this summer, this is one of them, made into a video by Tim one of the amazing people I met this summer on my bike! 5 things to do for Mother's Day in Victoria BC! 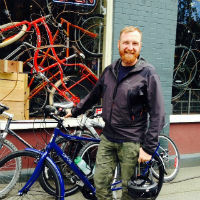 Including our tours at Bike Tours Victoria BC! Check out the Special Mother's Day High Tea Tour! A one stop travellers guide to Victoria BC! Check out Visitor in Victoria for a great listing of all things to do in Victoria BC. The Surprise at the End of the Street! Tucked away in a heavily industrialized neighbourhood, situated on the banks of the beautiful gorge is the Point Ellice House @ 2616 Pleasant St Victoria. Surprise! A little oasis tucked in between what is now and what used to be. I love the contrast between what is and what was! A very impressive historical find, the Point Ellice House is a time capsule of household Victoriana. Peter O'Reilly the first Gold Commissioner and first appointed judge of British Columbia plus large family lived at Point Ellice House, which remained in the family for over 100 years. I was able to have lunch at their newly opened fully liscenced cafe, O'Reilly's which serves a delicious variety of lunches, brunches and high teas served on the gorgeous grounds in the summer months and the newly renovated and beautiful barn in the fall and winter months at the Point Ellice House. This makes a fun, beautiful and delisious place to visiting when spending some time in Victoria. If you're looking for a leisurely activity to do in Victoria, my recommend would be to take a Harbour Ferry Cruise and jump off at the Point Ellice stop, spend some time at the beautiful Point Ellice House with a guided tour and then have a local craft beer, lunch or even high tea on the grounds. Chef Mike is amazing! Check out some photos I took. : Delicious lunch, an amazing find of some old Kerosene Bike Lights, High Tea, The Grounds and the table Sir John A. MacDonald ate! When my two most favourite things collide on one day! Donuts and Movies! Celebrating a new Holiday, Back to the Future Day with Cherry Bomb Toys and Empire Donuts. Fall & Winter Bike Tours - We Roll in Every Season! We're lucky to live in such a temperate part of North America with little to no snow and being the 6th sunniest city in Canada, their is plenty of time for fall or winter bike tours. If you're looking for things to do in Victoria BC this Fall and Winter and the sun is shining I offer flexible start times to The Highlight and The Discovery Tour. Tips for Winter Bike Riding! Bringing a few items for a winter bicycle ride is important in making your ride comfortable and fun! 1. Always dress in layers depending on your comfort level it's a good idea to bring an outer shell with a fleece sweater or jacket underneath. It can get cool by the ocean and then warm up as we ride through the neighbourhoods. 3. Probably the most important are some gloves that allow you to move your fingers when applying the breaks as we ride. Having warm fingers while riding is important but so is braking when you ride! Keep these tips in mind will help create an amazing and fun ride around Victoria this winter!